You would be surprised at the number of people that would like to use their camera in the car. With the introduction of cheap easy to use portable video cameras, everyone can shoot a video quickly and inexpensively. Why use it in your car? It’s especially popular for family trips. Driving in the mountains or peeping leaves? Shoot a video. Driving next to the ocean? Shoot a video. Well you get the drift. There is also a growing interest in dash cameras for purposes of documenting what the person in front of you is doing. Comes in handy for accidents and whatever else can occur in front of your car. When selecting your camera mount the most important factor is to have a steady mount. Match the weight of the camera with the sturdiness of the mount. Heavier cameras should use a heavier mount. The lighter cameras can use some less expensive mounts. A good rule of thumb is if it weighs less than a pound, that’s a light camera. More than a pound is going to need a heavier and likely metal mount to avoid any shimmy. The second important question is location. Most like to use a windshield and there are many suction mounts available for that purpose. We prefer the dash mount though as it is somewhat safer and does not block your view the way a suction mount may. A dashboard mount will also be way steadier as most windshield mounts use a gooseneck which is going to rock the same way your car did when it hit the pothole and to make matters worse, it just keeps rocking. So I guess I’m saying avoid most windshield mounts especially those that feature a flexible gooseneck as the shimmy will make you dizzy. Most car mounts will use a 1/4″ – 20 threaded screw. That pattern is the same as a tripod. If your camera has a tripod screw hole on the bottom, it will fit most cameras mounts out there. An exception will be the GoPro line. While the bare GoPro does indeed have a standard tripod screw hole on the bottom, most owners of this popular line of action cameras prefer to use it with the weatherproof clear plastic case. When that is used a special adapter with two grooves molded into it is needed. 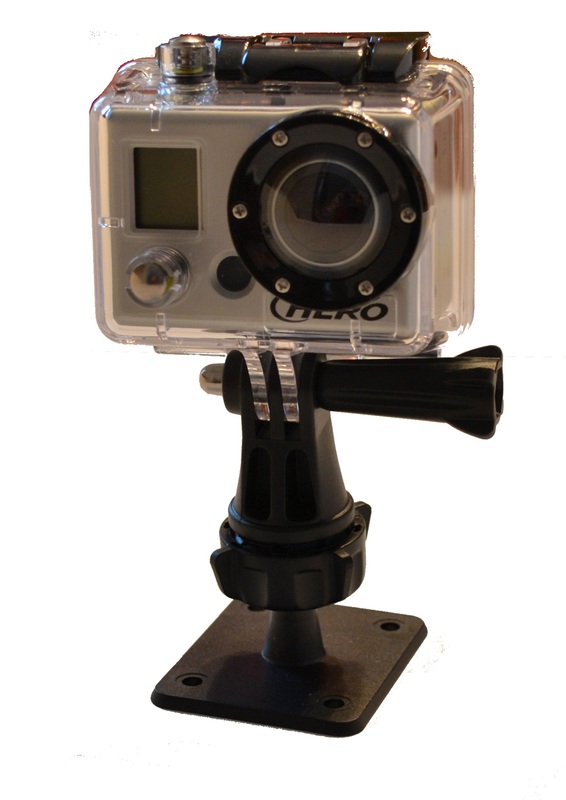 Buy a mount made for a GoPro if you have one as that will likely include the necessary adapter. Most car mounts manufactured for cameras are intended to attach to a windshield or dash. We like some recent heavyweight models that include a bean bag base which makes it easy to install and remove. We have also seen camera mounts that use a cup holder and some that use a clamp. The clamp is interesting in that you can attach it to the visor of your dash. Nice and steady and easy to install and remove. And for those who just prefer a motorcycle, there are lots of those mounts too. Just be sure to buy a high quality mount that does not vibrate.